Scholar of the First Sin includes all DLCs, new NPCs, more. Bandai Namco has announced Dark Souls II: Scholar of the First Sin for PlayStation 4, Xbox One, PlayStation 3, Xbox 360, and PC. Dubbed the “complete Dark Souls II experience,” the package will include Dark Souls II, all three downloadable add-ons (‘Crown of the Sunken King,’ ‘Crown of the Old Iron King,’ and ‘Crown of the Ivory King’), new NPCs and enemies, an expanded lore and new in-game events, re-balanced gameplay, online matchmaking, and more. The current-gen and PC versions will offer updated visuals and a higher maximum number of players for online play. And the PC version supports both DirectX 9 and DirectX 11. Users who already own Dark Souls II will receive the improved balancing and online matchmaking functionality, as well as expanded story content, free of charge via an large-scale update. 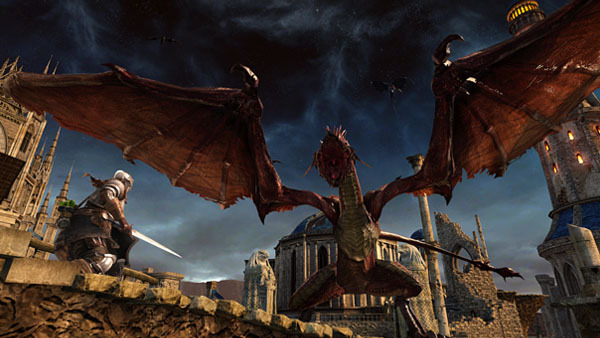 Dark Souls II: Scholar of the First Sin will be available on April 7, 2015 in North America and April 3 in Europe. Watch the debut trailer below. View some screenshots at the gallery.